The enclosure of Apple Watch Series 2 looks the same as the first Apple Watch, though there is a new ceramic White case available, and a series of new bands are available as well. The Apple Watch Series 2 starts at $369. The original Apple Watch, now called Apple Watch Series 1 will get the dual-core CPU update and be repriced at $269. 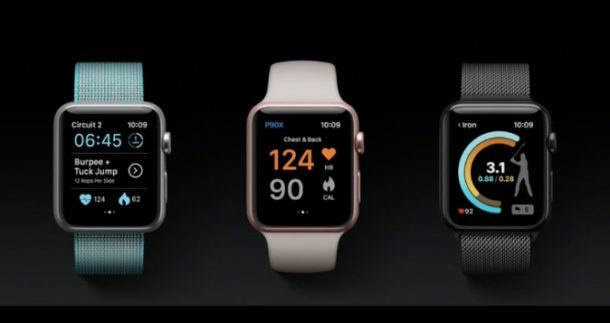 There’s also a variety of special Apple Watch Nike Plus edition models aimed at runners, with custom perforated rubber bands in four different colors, and running centric software specific to the Apple Watch Nike Plus model. Apple Watch Series 2 will be available on September 16. Apple has supplied the following video overview for Apple Watch 2, highlighting the water resistant and running focused features. I like the idea of a running-focused watch. With a few carefully-selected tunes and some Bluetooth headphones, you’ve got yourself a nice system for lightweight workouts. I don’t have a watch now, so at $500+ it does seem very expensive just to get geeky about my running. They didn’t mention it here but the original apple watch was also improved and they now call it series 1. You could buy that one for less than the 500+. Or the series 2 with aluminum case, also. cheaper…I believe the 500+ mark is only for the stainless steel cases. I just feel sorry for those who bought the original apple watch edition, the gold or rose gold one. Apple ripped them off big time by selling them a $10k-17k watch that’s now outdated. What a robbery. Are you really as stupid as your posts suggests ? Isn’t it a bit suspicious that there was no mention of battery life?